The second best thing about Chichicastenango is its name, a long, Mayan utterance whose suffix alone reveals its disassociation with the Castilians. Thus is Central America, where the previous world bequeathed its greatest gifts in the form of language. In El Salvador, it's the proliference of Petls and Peques in the place names that reveal the presence of a people before the Spanish, and in Nicaragua it's the Galpas and Tepes that evoke Mezoamerica's children (in the latter case, the Nahuatls, whose influence on language extends to hundreds of words in use today): in Guatemala it's the Nangos that proliferate in place names like this one. Continue reading "Chichicastenango"
Whenever I hear about 9/11, I will hear, from the background of my memory, the sound of monkeys. Ericka and I had arrived a day earlier on a little, twin-prop airplane that had carried a dozen of us north from Guatemala City over the verdant canopy of Central American jungle to Tikal in Guatemala's northern province, and back in time five centuries to a Mezoamerica the jungle swallowed whole. We entered the ruins at daybreak under the silhouettes of monkeys in the treetops above us, climbed temples to look out over the jungle canopy, wondered quietly about the lifestyle of a people whose world ended before ours began and whether that world made any more sense or was in any way more satisfying than this one... Continue reading "The Mayan Ruins of Tikal"
Stunning Lake Atitlán is ringed by volcanoes in the highlands of western Guatemala. A strongly Mayan region, Atitlán is populated with quiet towns of farmers and artisans which, except for the new tourist trade, live much the way they did five hundred years ago. 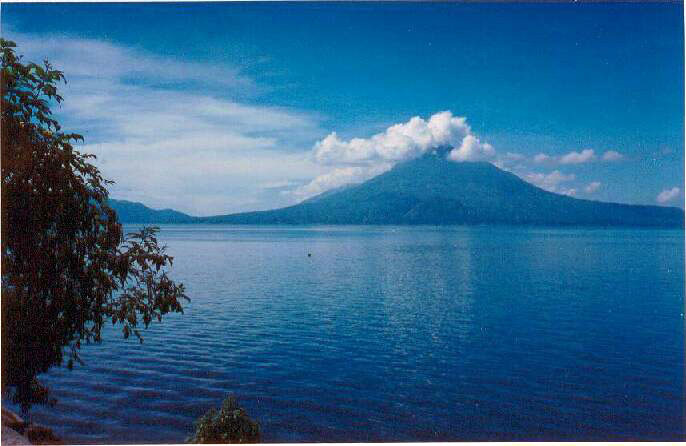 Continue reading "Lago Atitlán"